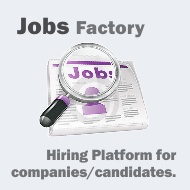 Jobs Factory is full Job board and recruiting solution for Joomla 3.x. Our Extension allows you to create a turnkey Job Board and to begin monetizing right away. You can test Jobs Factory by clicking the menu on the left, and check out the administrative backend by clicking on the menu on top. Jobs Factory is our Joomla! solution for a Job Recruitment system that allows you to create a Web portal which will help companies post job openings and for job seekers to fill in their resume. You will be able to create a broad range of implementations - from a niche website, covering only specific business areas (e.g. IT, Advertisement, Marketing, etc.) to a fully fledged recruiting platform. Using our Job Board Extension you can create a website that allows users to register as Companies (employers) or Candidates (job seekers). Companies can add as a recruitment criteria experience, study level or language required from candidates and also post specific information about the job offer itself, like position, job type, category and further details. Candidates can apply to existing jobs with just one click, their resume information is transmitted directly to the employer. Employers then have a list of resumes to analyse and select the best suited candidates. Once selected they can contact them and establish an interview or appointment. The Webmaster can add an unlimited number of Categories, Job types, Experience levels, Study levels and custom fields that allow companies and candidates to fill in their profile and expand the search criteria. Jobs Factory allows you to create and use Cities / Areas and use them to narrow the search down. Candidates can search with ease job openings in their area. Jobs Factory also comes with several integrations, extending the capabilities of the component. Google Maps integration offers companies the possibly to add the location of the job directly on map by just pinpointing it, allowing users to find it by performing a simple Radius Search. With Radius Search users just have to add a part of the address like a city for example and input the radius for the search.